PART # 47-201 or 26-2185 or 65083. NEW COMPLETE CHROME HANDLEBAR CONTROL KIT. FITS: 19 72-1981 HARLEY XL IRONHEAD FX FXE FLH SHOVELHEAD BIG TWIN, CHOPPER. One of the most complete kits you'll see anywhere and at a super price! 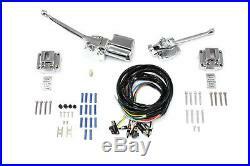 These chrome-plated control kits feauture black switches and complete handlebar wiring harnesses. For use with 1 handlebars. Perfect for those of you building bikes from the ground up wanting clean simple controls with just the right switches & buttons. They will also fit all models from 1972 thru 1981 and are perfect for converting the black or silver-painted Original Equipment parts to show-quality chrome controls. A master cylinder and clutch lever assembly, two switch housings, the complete handlebar wiring harnesses with black switches and button caps attached, and all of the hardware necessary for installation. The item "Chrome Handlebars Control Kit 72-81 Harley Ironhead Sportster Shovelhead Chopper" is in sale since Tuesday, November 18, 2014. This item is in the category "eBay Motors\Parts & Accessories\Motorcycle Parts\Handlebars, Grips & Levers\Handlebars". The seller is "americanclassicmotors" and is located in Zieglerville, Pennsylvania. This item can be shipped worldwide.